While I may agree with Shakespeare’s Juliet regarding names and status, when it comes to color, I believe a name can be so much more. A name is an identifier. We like to label and categorize. It helps us understand. A good color name evokes an image, or it sparks a memory. A REALLY good color name makes an emotional connection. Chocolate Soufflé tickles the senses of taste and smell, it’s definitely a rich brown whether it is a wall paint or a scarf. Degas Pink and Monet Skies may not give you a precise color image but they do give a sense of how the colors will feel if you use them in your color scheme. Citron is going to be tangy and crisp and bright. Decisive Red, I may not know exactly what that red is, but I want it! Some color systems use only numbers to identify a color and sometimes the numbers correlate to where the color exists in a more scientific model of color space. This is excellent and precise for those who understand and specify color professionally. Thank you for those systems that get it right! But this post today is more about the conversation of color, the SOUL of colors. In my experience with color naming, there is quite a bit of latitude, often it is dependent on the situation. Sometimes the concerns are practical such as with a printed piece, where it has to be short enough to fit the allotted space. If the paint chip is two inches wide, the name and number shouldn’t be too lengthy. A color name for tile grout needs to be simpler and not too fluffy. With nail polish, the sky is the limit and the more outlandish and “punny” the better. If you are making a color decision with a purchase, the actual name of the color is often secondary. Names can have a subliminal influence though and if you are indecisive, the name connection may help you to decide. That’s where my motivation is lit. I want the color names to touch you in such a way that you are confident that one particular color is speaking directly to you. Conversely, if the name doesn’t really fit the color it can cause confusion. Many names are nebulous and trust me, when you have 2,000 colors to name on a project, they sometimes get a little sketchy. After Midnight Blue – It would be a deep blue, probably the darkest of the blues offered. Ballet Slipper—trickier, is it a blush of pink or soft, satiny ivory? Enchanting Ginger – hmm, what makes this particular ginger so enchanting? As you can see, color can be complicated and sometimes the names don’t really make it simpler, but they are infinitely more fun! Color Marketing Group members have a blast when it gets to be time to name the World Color Forecast™. Secrets of the Deep is a dark mysterious blue. Big Hug is a mid-tone, peachy-pink. Schlime (one of my favorites) is a dark, organic, green-toned black. I bet you can picture that one! Some of the fun in naming is born from the fact that there are few rules. Common sense dictates that the name be descriptive and not offend. When I worked for a paint company there were a few situations where questionable names slipped by the proofers or took a turn south when translated to another language. Perry’s Winkle, anyone? All innocent mistakes, but costly nonetheless, so yes, naming is a serious game in business. There are so many factors that can influence a color name; cultural differences, psychology, historical associations. Sometimes creating themes helps to wrangle a palette. I bet you have seen some good ones when shopping online. Accurate descriptors are super important when the actual color of a product is viewed digitally. You might not be drawn to the colors named Sad Little Day or Dragon’s Tears but then again, color is personal. 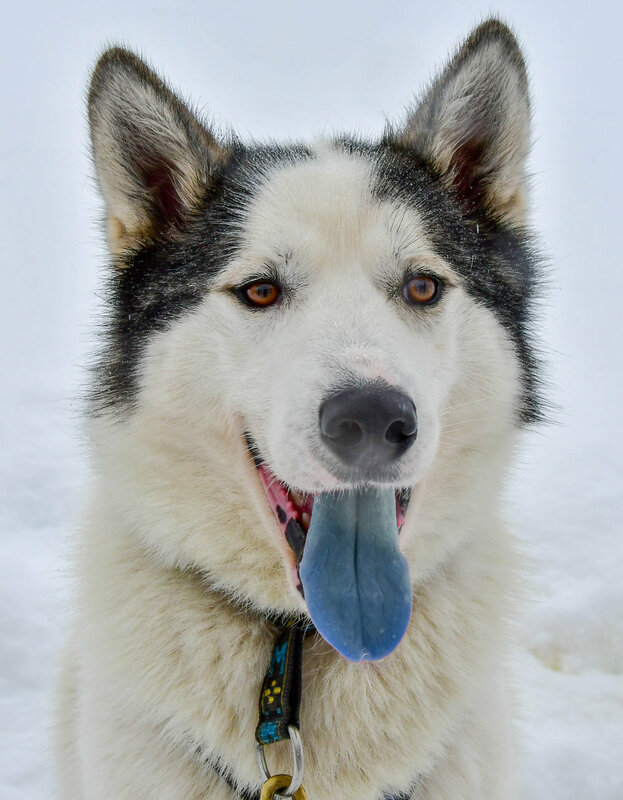 If you want to read more about color names, check out this article call 11 Color Names You’ve Probably Never Heard Of at Mental Floss or this one at TopTenz called Top 10 Weird Colors You’ve Never Heard Of . And not to be outdone, here’s a selection of Dumb, Silly Paint Names. Oh, what the heck, one more: Ten Weirdest Car Names. In 2017 Color Marketing Group members forecasted the color TBD as the North America Key Color for 2019. How did we know? Did we get it right? What does it mean? “A color with varied facades and multiple meanings, TBD… represents tumultuous times, as well as moments of exhilaration. It embraces the trend of needing to balance the disquieting sense of what may lie ahead with the need for unbridled, spontaneous fun. 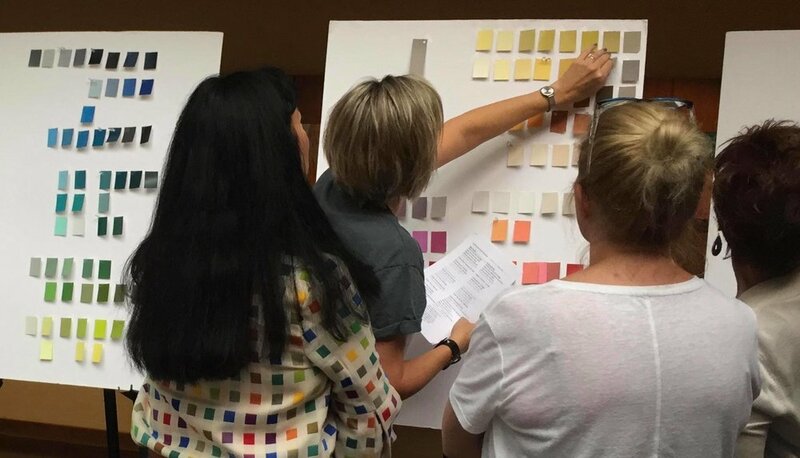 ChromaZone workshops take place around the world and the results are then steered to a single palette of 16 colors for each CMG region and they are combined to form the World Color Forecast™ of 64 colors. The North American steering committee chose TBD because of the prevalence of this strong yellow throughout the workshops and the support of the membership that it told a story of where we are as a society right now. As stated above, it is both a positive and cautionary message. The members of CMG who make the forecasts are involved in the development of products for their companies. They are looking into the future to see the directions to which their customers will be shifting, color-wise. For them, whether they choose the right color is about whether that product will sell in that color. The actual application of the colors in their many nuances, degrees and combinations falls to the members and their knowledge of their products and consumers. CMG tracks the predictions throughout the year of the key colors for each region and highlights the success of 12 of the 64 colors in their Color Alert profiles each month. This Colorfuel video shows the qualities of yellow as a hue family. A snapshot of the emotion behind the color and the “feels” it can convey. 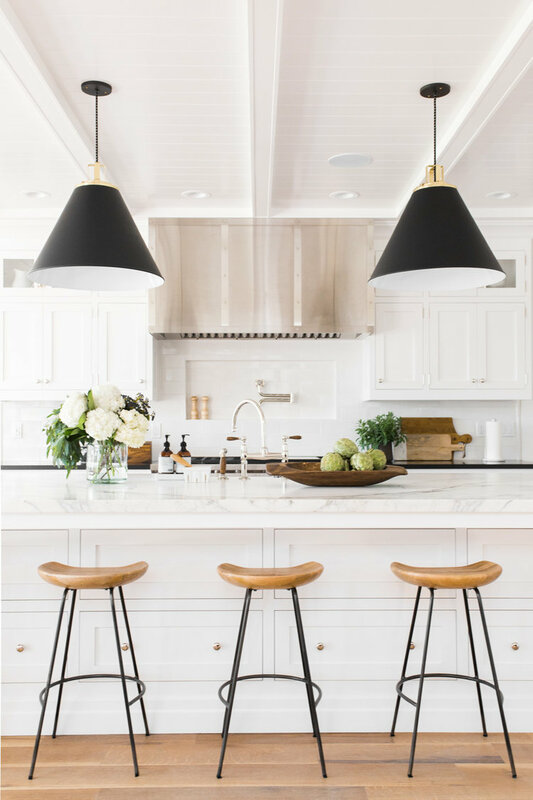 In home design, the yellows we will be seeing this year range from the electric TBD to the more friendly golds and butters. Mustard has been strong in home and fashion for the past year + and it is interesting to see the many discordant combinations that are making it feel so new and fresh. As consumers we have the luxury of watching, following, or ignoring the forecasted colors. If we agree that some form of yellow is going to make us happy right now, isn’t it awesome when we see those yellows in the market? Those products will be based on the forecasts of the designers and producers that spent countless hours trying to figure out which yellow will be the one we choose. This iconic clip from the Devil Wears Prada illustrates that we are never immune to the color trends. Sign up with your email address to receive news and updates. Fuel your passion for Color. You will not be inundated with emails - I Promise! Sometimes we look for guidance when we are uncertain about how to tackle a color project. Some of the advice is good, some is scary, some needs to be ignored. Why not break some color rules? Get out of our comfort zone and be bold! White ceilings are perfectly fine. Nothing wrong with having some continuity throughout a colorfully painted home. But ceilings can be other colors. They can match your walls. They can make a statement. If you want to stick with a white ceiling, many designers recommend adding a touch of your wall color to the ceiling white. 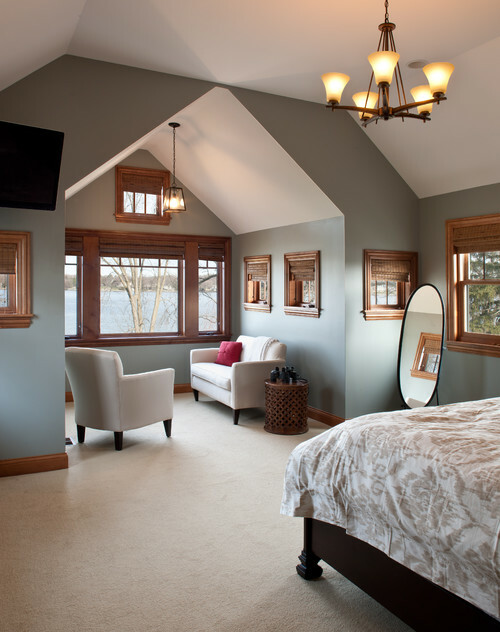 This bedroom shows a contrasting color to highlight a vaulted ceiling. Another with a stunning contrasting color. 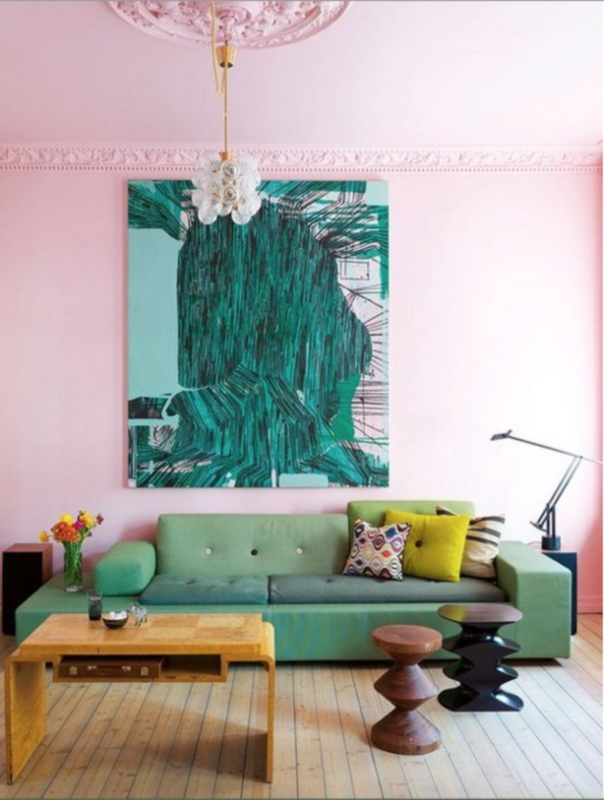 This one wraps the pink from the walls up to the ceiling for a dramatic effect. Rather than fighting against the architecture of a room, embrace it! Go for cozy. Go for drama and make that room special! I don’t know about you but I’m not thinking about the size of this bedroom, it’s just gorgeous. A powder room that is swoon-worthy in black? Yes. This post on thecreativityexchange.com has more moody dark painted rooms. Think of your wood trim as just another color that you are working with. Every room you paint will have some permanent features that need to be considered, such as trim, flooring and furniture. The key is picking a gray that works with the color of the wood. Browns are from the orange, yellow or red hue family and once you determine their “base” you are set to pick your gray. And this kitchen! So fresh in a pale gray and yet the trim is strong and has that lovely been-there-forever look. Let’s stop this silliness. Your baby is gonna cry sometimes but it is not because of the color you painted their nursery. The old wive’s tale conveyed that if you painted a nursery in a bold yellow, the jarring color would keep the baby awake. No science to back this up. Here are a few perfectly beautiful and sunny yellows that any baby would bask in. This playroom has a fun splash of bold yellow. 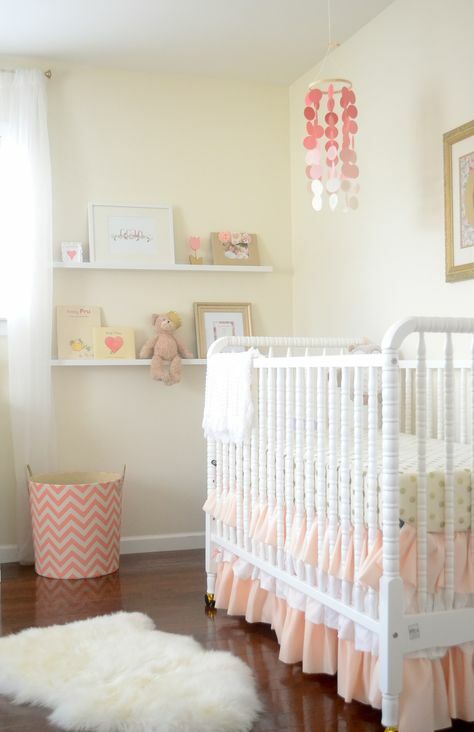 This yellow nursery is soft and sweet. In the past, you maybe wouldn’t consider bringing in that trendy gold or brass metallic because everything in your home was silver. You don’t have to stick to one finish! It’s really ok to have a mix. Take a look at these beauties. Studio McGee’s post has more tips for mixing metals. Along the same lines as the metallics, you can mix it up with wood finishes. 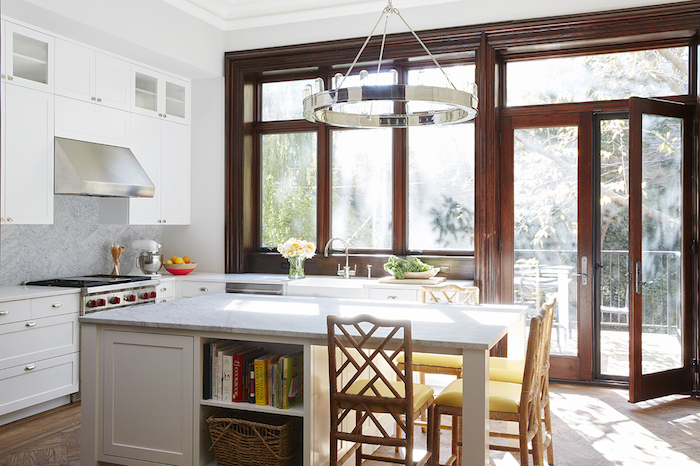 This post from Ballard Designs offers good tips on getting the right balance. This room has a mix of wood colors that are unified by the rustic finish. This mix of finishes is unified with a highly textured rug. My mantra for color is that it doesn’t have to be complicated. I feel like some of the “rules” surrounding the use of color can be limiting and deceptive. Color is fun and it is personal. Follow your gut and if you get stuck know that there is always a way to COLOR yourself out of it. It’s all in the mix and the combinations of colors. These aren’t necessarily “rules” from me but there are a couple “suggestions” that I would recommend when shopping for paint colors. #1 Always test your paint colors out with large samples before you decide and then #2 live with them for a bit. This post Color Confused? TRY IT ON talks a bit more about testing paint colors. All of the fabulous colors!! 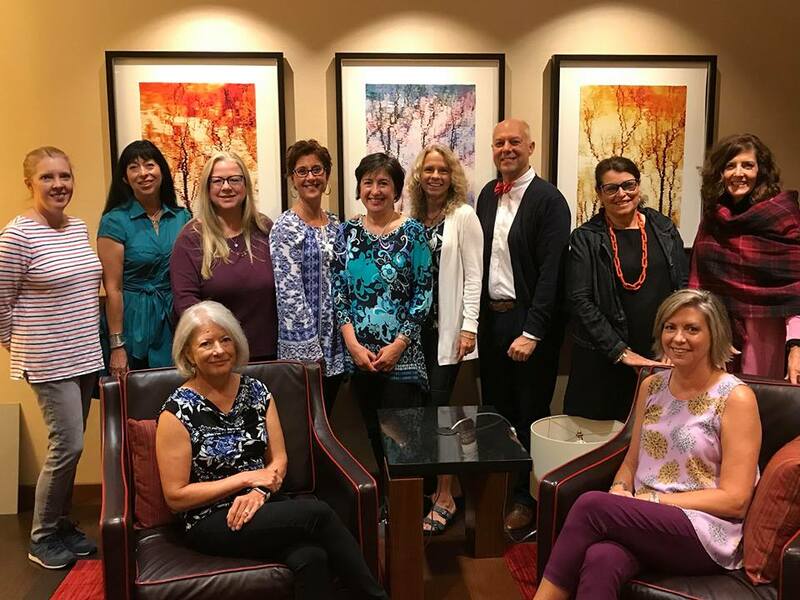 The CMG North America ChromaZone facilitators met this past weekend in Washington, DC, CMG Headquarters to pore over all of the results from this year's workshops. As VP of Color Forecasting for the organization, I had the pleasure of gathering with the team and finalizing the forecast. See my post on the CMG website to learn more about the process. I am joined by a colorful, knowledgeable and hard-working team of professionals who selflessly gave of their time to represent the work of their individual workshops of this past year. And special thanks to our irreplaceable CMG Executive Director, Sharon Griffis who took this picture. We make assumptions when seeing color, consciously or unconsciously. Color evokes an emotional response. There are cultural generalities surrounding color and there are very personal reactions. What if the color expectations are flipped on their head? What if they are not as we expect? Does the deviation make you uncomfortable? Does it spark and inspire? Established in 2009 by the International Color Association as a day to appreciate and celebrate the importance of color in our lives. March 21st. Click here for a little color inspiration or here.